Iran’s war games this month showcased missiles with improved accuracy and firing capabilities, Iranian media reports. Iran’s war games this month showcased missiles with improved accuracy and firing capabilities, The Associated Press reported on Friday, based on Iranian media reports. Iran's powerful Revolutionary Guards conducted the exercise in the central desert, firing ballistic missiles including a long-range variety meant to deter an Israeli or U.S. attack. The targets were models of foreign military bases, and the exercise’s stated goal was to show that Iran's missiles can hit Western bases and Israel. Several Iranian news websites reported on Friday that 90 percent of the missiles hit their targets and said this showed their increased accuracy. Another achievement, the reports said, was Iran's capability of firing multiple missiles within seconds. The reports said this would create a challenge for the U.S. or Israel to intercept incoming missiles should a war break out. AP noted that Iran has a variety of missiles, including a Shahab-3 variant with a range of 2,000 kilometers that can reach Israel and southern Europe. The missiles, which can carry a nuclear warhead, are also capable of hitting U.S. bases in the region. Some of the missiles used during the war games used solid fuel, the reports said, improving the accuracy of the missiles. “Within 10 minutes, a considerable number of missiles were fired at a single target. The achievement, called high firing density, makes it impossible for anti-missile systems to intercept and destroy them. 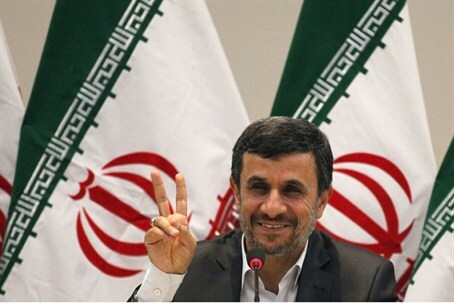 In the end, the target is definitely hit,” said a report on irannuc.ir. A June 29 Pentagon report to Congress said that Iran’s military continues to improve the accuracy and killing power of its long- and short-range ballistic missiles, including designing a weapon to target vessels. “Iran has boosted the lethality and effectiveness of existing systems by improving accuracy and developing new submunition payloads” that extend the destructive power over a wider area than a solid warhead, the report signed by U.S. Defense Secretary Leon Panetta says. The commander of the Revolutionary Guard's Aerospace Division, Gen. Amir Ali Hajizadeh, threatened earlier this month that Israel would disappear from the Earth if it attacks Iran.